Security is everything. Your data is first compressed to ensure bandwidth usage is minimized during data transfer. Your data is then encrypted and only stored in UK data centres, giving you the peace of mind your data cannot be accessed or decrypted by others. Reduce your costs and risk of human error when maintaining a tape backup solution. You will no longer need to remember to take a backup offsite each evening. With just a few clicks you can have your lost/damaged data or even failed server back to a consistent state with ease. 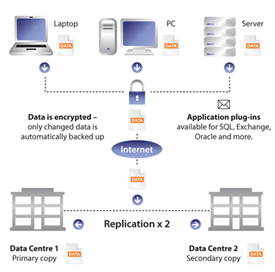 From £600+VAT per year for 1Tb server data storage, our online backup service can protect your data with complete ease and automation. Data stored on your servers, laptops and PC’s is the most valuable property for the School and requires appropriate protection. Security is everything. Your data is first compressed to ensure bandwidth usage is minimized during data transfer. Your data is then encrypted and stored in UK datacentres only, giving you the peace of mind your data cannot be accessed or decrypted by others. Fault tolerant hardware and multiple data centres, this ensures the service is always available. Performs online and onsite backups so you can gain quick server recovery. Reduces IT costs as hardware, software or human resources are not required.